High-temperature grease for guide fingers of a brake caliper sliding carriage. Special high-temperature grease applied to prevent sticking and seizing of brake pads on guide fingers of a sliding carriage. Provides accurate operation of the whole sliding carriage mechanism, absolute abutment of brake pads and quick unbraking of a brake disc at the end of braking. Prolongs service life of the whole braking system of a vehicle. 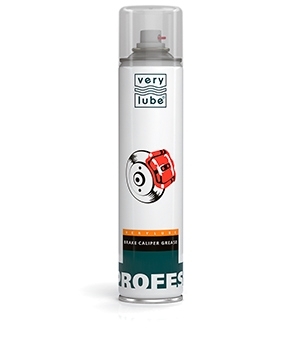 Eliminates noise and creaks when braking. Has a wide temperature range of application: –35… 400 °С. 1. Twist out the guide fingers of a brake caliper. 3. Apply evenly several layers of the grease (up to 5). Let each layer dry before applying the next one. Use when replacing brake pads or next maintenance work.